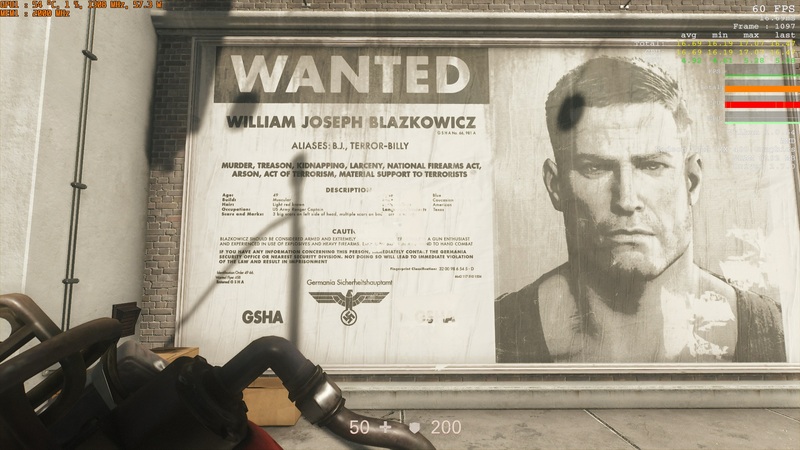 Wolfenstein II: The New Colossus is a damn fine game, you can read all about how awesome it is right here. But we are here to find out how it runs on the PC and would a mid-range configuration from yesteryear be enough to give you your fix of mowing down Nazis. 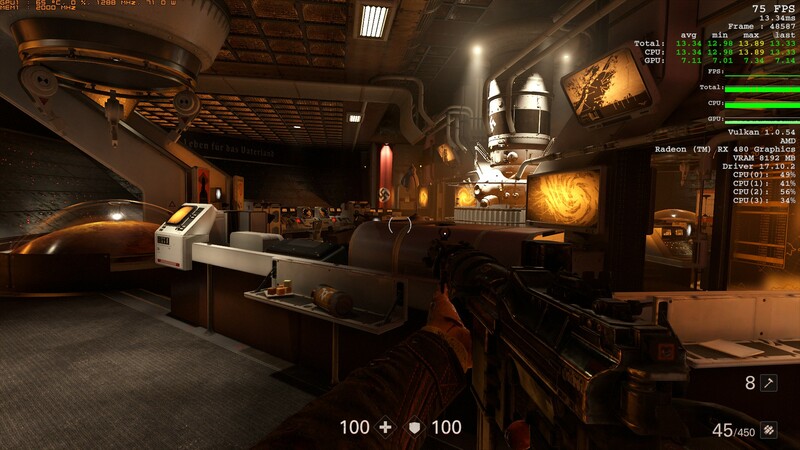 MachineGames’ first run-in with Wolfenstein was their soft-reboot of the series with Wolfenstein: The New Order. The New Order was built using id Tech 5 and this led to the game being a fairly competent port but ultimately lacking in several PC-centric features, these being a locked frame-rate (30fps or 60fps), poor performance on cards with limited V-RAM, excessive screen-tear without V-Sync enabled and overall a very flat look to the game. Although the video settings were fairly verbose there was no detailing on what Anti-Aliasing solution(s) were implemented or how did the Level of Detail (LoD) slider function. 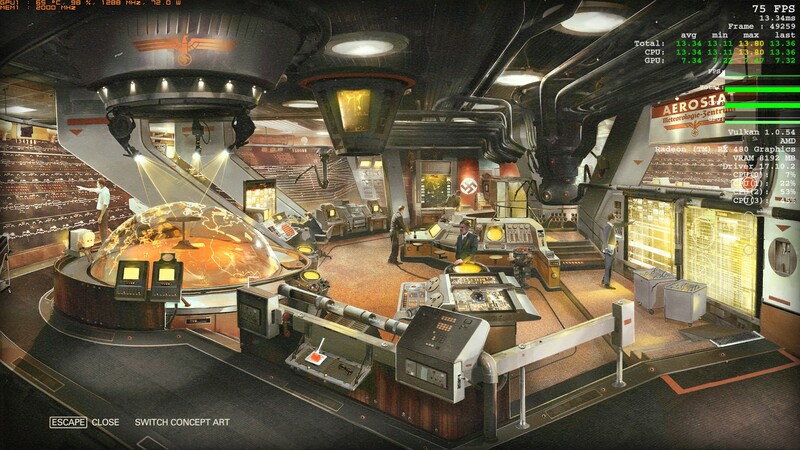 These shortcomings were somewhat remedied by the clever use of lighting and a commitment to an aesthetic language which gave the game a unique look but was not enough to cover or account for all shortcomings. 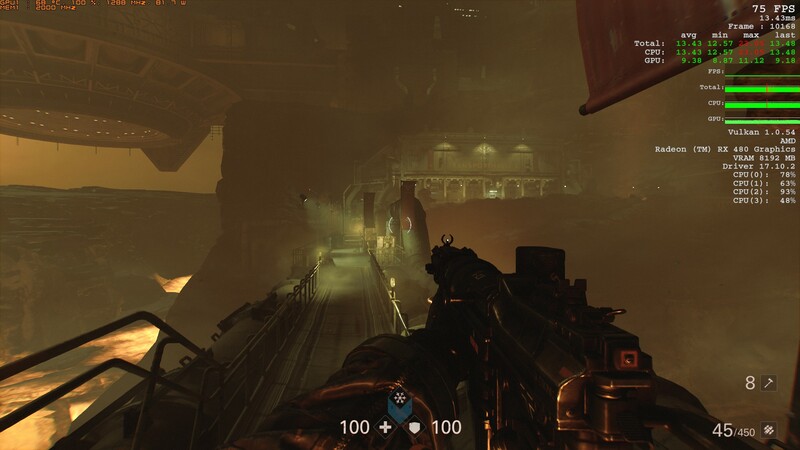 Another notable issue with The New Order and later on the Old Blood was the inconsistent audio mixing which led to a myriad of issues like dialogues overshadowed by the music. 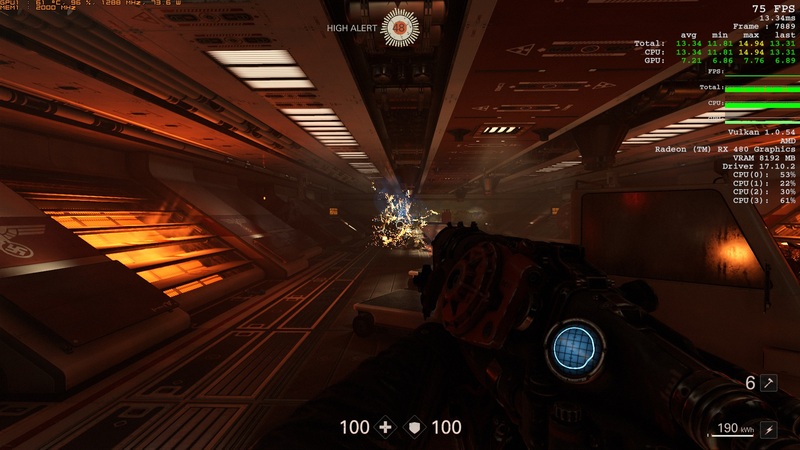 Wolfenstein II: The New Colossus is built on id Tech 6 and remedies a lot of the The New Order and Old Blood’s problems stemming from the premise of making sure the game is shipped functionally. The entire settings menu has been revamped with more graphical options which are better explained with a comprehensive list of presets. On the PC side of things, the frame rate is unlocked although you will still suffer from screen tearing unless you run the game at a sufficiently high frame rate, consistently or implement adaptive solutions like V-Sync or AMD’s FreeSync and Nvidia’s G-Sync. Gone is the problem of textures and lighting with a flat look, gone is an aggressive LoD culling (still present in open levels) and that has been replaced with a slick new presentation and a game that manages to stick to a locked frame rate consistently without looking like a last-generation title. The inclusion of post-process effects like Film Grain and Sharpening give The New Colossus a very distinct look if you compare the game to other stylistic shooters like BioShock. All this is fine and dandy but what is not great is the game’s pernicious habit of crashing at the drop of a hat. At least on our test PC, the first five hours of the game were punctuated by no less than 20 hard crashes to the desktop, which if one does the math equates to about 15 minutes of shooty time before being yanked out of the fun. This even after having downloaded the latest patches and the game-ready drivers. Due to stability issues and for the sake of hitting their deadline MachineGames had to disable Steam’s stock in-game overlay. AMD drivers and ReLive seem to face an issue which is odd considering it is in development partnership with Bethesda and the game runs on the Vulkan API which generally favours AMD hardware vis-à-vis Nvidia. Nvidia’s ShadowPlay recording software seems to work just fine and has been confirmed to us by forums members as well as our colleagues over at Gadgets360 but AMD ReLive does not function. In the end, the base build of the game with its Day One patch had to be run sans AMD’s Radeon Settings software in the background. The GPU vitals were monitored via MSI’s Afterburner utility and frame-rate targets were dictated by Rivatuner. The in-game performance metrics display is very helpful, super customisable and was the primary tool used to double check on the percentile frame times and CPU, GPU load readout. Alt-Tabbing in-game was a 50:50 odds in which the game may or may not crash. Running on the Über preset with framerate locked at ~75fps and later at ~99fps, we faced minimal issues on our hardware although every now and then there was a frame drop that lead to the action pausing for a couple seconds before continuing. Apart from disabling the AMD Radeon software, it is recommended to check if Radeon Chill is turned off as well. If you cannot stand frame tearing, which is especially apparent in the cutscenes, we suggest that you turn on V-Sync or make sure to run the game consistently above your display’s refresh rate. Finally, due to the uncertainty over why the game was crashing and the fact that the Field of View (FoV) slider clearly states that altering the base value might destabilise the game we suggest you keep it at 90 for now. That is not all though, MachinesGames has already released a Beta patch which reinstates overlays. After spending a few hours with the patch we can confirm that the Steam overlay works fine although AMD ReLive still refuses to function and running the Radeon drivers in the background was a good way to trigger the game to crash. This is after we updated to AMD Radeon’s latest v.17.10.3 drivers. Apart from running at a high frame rate consistently, the game is certainly one of the prettier looking releases this year which is bolstered by its unique retro-futuristic presentation of the 1960’s under the Nazi regime. 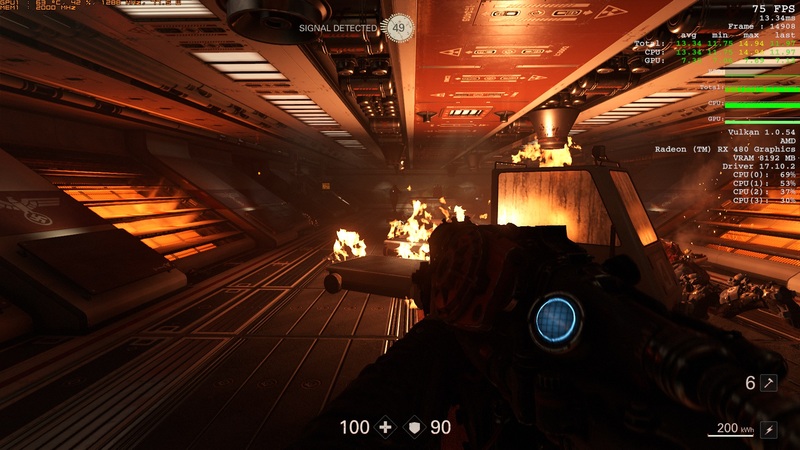 id Tech 6 and the Vulkan API really help MachineGames flesh out their vision. There are a few issues currently holding out, one of them being that AMD graphics users will have to employ a lot of workarounds. There is currently no way to reset the game to your default optimised settings without rebooting it in Safe Mode. The initial load times on your first boot into the game is quite long than subsequent load times even after installing the game on an SSD. Another point worth bringing out is that F5 and F9 are bound to the Quick Save and Load functions respectively but it is not mentioned in the PC control scheme which might cause issues if you try to take screenshots using these Function keys. As it stands, there’s a lot to love here but also many things that need to be fixed. MachineGames has already issued a beta build which enables the Steam overlay. I hope they continue to fix this because Wolfenstein II: The New Colossus is better than The New Order in every way. The issues highlighted here are for the day one and week one PC gamers who want to play The New Colossus. For a franchise that started on PC and has such a rich history on the platform, it is disappointing seeing some of the issues present here.